A beautiful guitar worthy of a great player! The Martin 000-28EC Eric Clapton Signature Acoustic Guitar is handcrafted with a premium East Indian rosewood back and sides and a bookmatched top of select quartersawn Sitka spruce. Its smaller 000 body size and short 24-9/10" scale help produce delicate, balanced tones. The rosette and soundboard are inlaid with herringbone wood marquetry, and the body is bound with grained ivoroid. An ebony fingerboard features a long diamonds-and-squares pattern in abalone pearl. Eric's signature is inlaid in mother-of-pearl between the 19th and 20th frets. Tastefully appointed with hand-beveled tortoise pickguard, nickel-plated open-geared machines equipped with unique butterbean knobs. Each Martin Eric Clapton Signature Guitar bears an interior label, individually numbered in sequence. 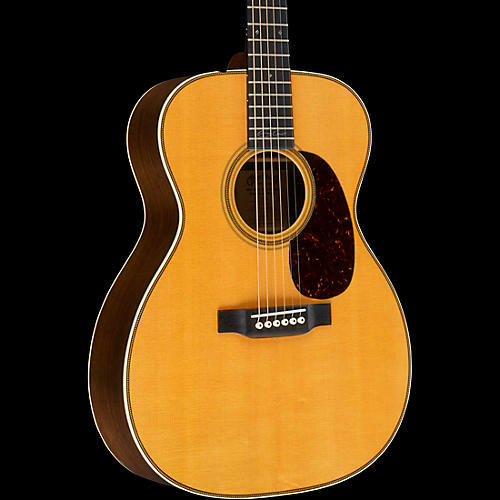 Includes limited lifetime warranty and deluxe Martin hardshell case. Choose Natural or 1935 Sunburst in the drop down menu.